Jason Rezaian, Iran espionage charge: Washington Post reporter still jailed. 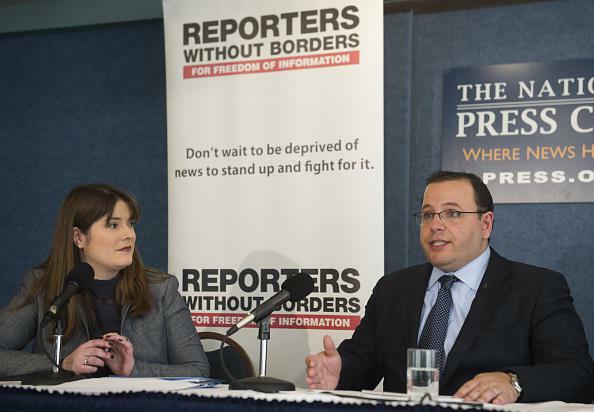 Delphine Halgand, the United States director of of Reporters Without Borders, with Jason Rezaian’s brother Ali Rezaian at the National Press Club in Washington, D.C., in February. Washington Post reporter Jason Rezaian has been charged with espionage in Iran, the paper says, citing his lawyer. Rezaian is the Post’s Tehran bureau chief and was arrested in July 2014. Ahsan is “believed to be the only person outside the judiciary” to have read Rezaian’s indictment, and the Monday meeting between the two was the first time since his arrest that he was allowed to consult with a lawyer. Rezaian is expected to be tried soon by Iran’s “Revolutionary Court.” The State Department says it has “repeatedly” asked Iran to release him during recent negotiations with moderate President Hassan Rouhani’s administration; the Guardian has reported that the case against Rezaian is being pushed by Iran’s intelligence service in an attempt to undermine Rouhani. The State Department has also called for Iran to release former Marine Amir Hekmati (who is accused of espionage) and pastor Saeed Abedini (who is accused of attempting to create “a network of churches in private homes”).